Today my guest is Tom E. Brown. 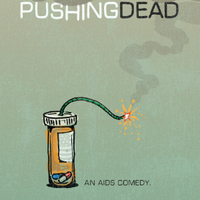 I had him on to discuss his over 10 years in the making feature-length debut Pushing Dead. The film premiered at San Francisco's Castro Theatre in June of 2016 at the Frameline Film Festival and won the Best Feature Audience Award. When a struggling writer, HIV positive for 20+ years, accidentally deposits a $100 birthday check, he is dropped from his health plan for earning too much. In this new era of sort of universal care, can he take a helpless bureaucracy but also come up with $3000 a month to buy meds on his own? Welcome to the world's first AIDS comedy. This is easily one of my favorite conversations I've had since starting the show. Tom is a great guy, funny as hell and happens to have made a wonderful film.